Unique 2391-52 Written PaperQuestions practice. This product is a combination of the 2391-50 and 2391-52 Written Paper Questions products. Is a combination of 2391-50 and 2391-51 Written Paper Questions. It does not contain questions which are not already in the 2391-50 and 2391-51 products. Using this 2391-52 Written Papers Question Practice you will be confident that you will have practised similar question to those you will be presented with in the 2391-52 Practical Exam. Up to date to 17th Edition Amendment 3. The 2391-52 Written Papers Question Practice is delivered online and as you answer and complete each question, you will be presented with a model answer. You can assess your performance and understanding against the model model answers. The Electacourse 2391-52 Written Papers Question Practice also includes scenarios with associated questions. Being able to answer questions in the context of scenarios improves your ability to recognise and understand Written Paper Questions. 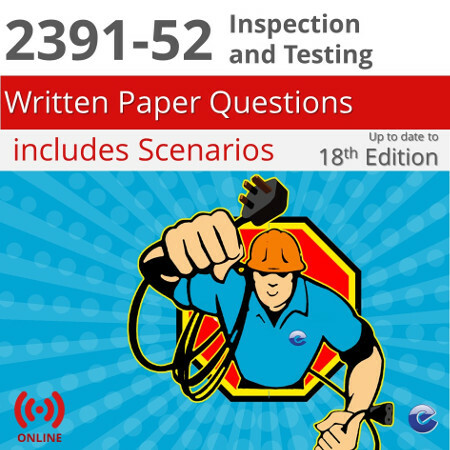 City & Guilds state that the 2391-52 qualification is aimed at practising electricians who have not carried out inspection and testing since qualifying or who require some update of training before going onto other City & Guilds qualifications. The qualification is also suitable for those with limited experience of initial inspection of electrical installations, such as those entering the industry from other engineering disciplines or who have been working in allied trades. It is more likely people who are aiming to qualify as electrical contractors will take the two exams 2391-50 Initial Verification and 2391-51 Periodic Inspection, rather than this single 2391-52 Inspection and Testing exam. Online 2391-52 Inspection and Testing Exam Practice available from any online device. No minimum subscription period. Unless cancelled by you, we will cancel the subscription after 12 months after which the content will no longer be accessible nor will be taking any subscription.